Sharp provolone helps cut through some of the saltiness from prosciutto and soppressata, while a topping of tomatoes and roasted peppers gives added depths of flavor. After piling a roll with hot capicola, sweet soppressata, prosciutto, salami and fresh mozzarella, it is topped with sweet peppers, extra virgin olive oil and finished with an aged balsamic. We’ve never met Anthony, but we sure do love his concoction of pepper ham, Genoa salami, hot soppressata, imported capicola and prosciutto, sharp provolone and roasted peppers topped with romaine lettuce for a bit of a twist. You’ll find usual suspects here like prosciutto and Genoa salami, but the real stars of the show are the sliced pepper shooters which add quite a kick. 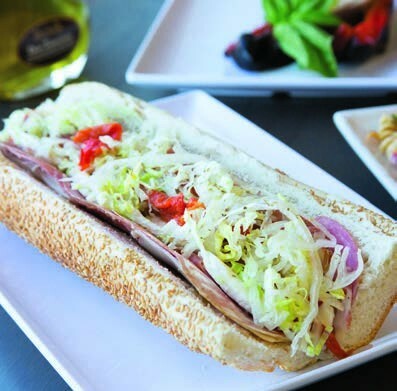 This sandwich certainly is “big.” Sharp provolone, prosciutto, both hot and sweet capicola, and Genoa salami are stuffed into a baguette that’s been coated in a deli-style relish with slow-roasted tomatoes and pepperoncini added for good measure.